Posted on 02/11/2019 Can You Work With a Bulging Disc? ?Do I have the right to a 2nd opinion? If you have been injured at work and are now seeking Workers’ Compensation for medical costs that you have incurred, you need to explore all of the types of benefits to which you may be entitled in an Iowa Workers’ Compensation claim, depending on your case. You may find it beneficial to consult with a Workers' Compensation attorney. Understand that workers’ comp is not a one-size-fits-all program. There are benefits that will reimburse you for medical expenses and others that will help with the costs associated with missing work. If you try to handle this type of claim on your own without legal guidance, you may miss out on some benefits. An attorney who has a thorough knowledge of Iowa workers' comp laws can help you maximize the value of your claim and ensure that you seek all benefits tailored to your particular injury. Your first step should be to contact your employer as soon as possible and take a look at your benefits package. Read it carefully to see what type of Workers’ Compensation claim you can make and what type of policies your employer has in place. Make sure you understand all deadlines involved in filing a claim. 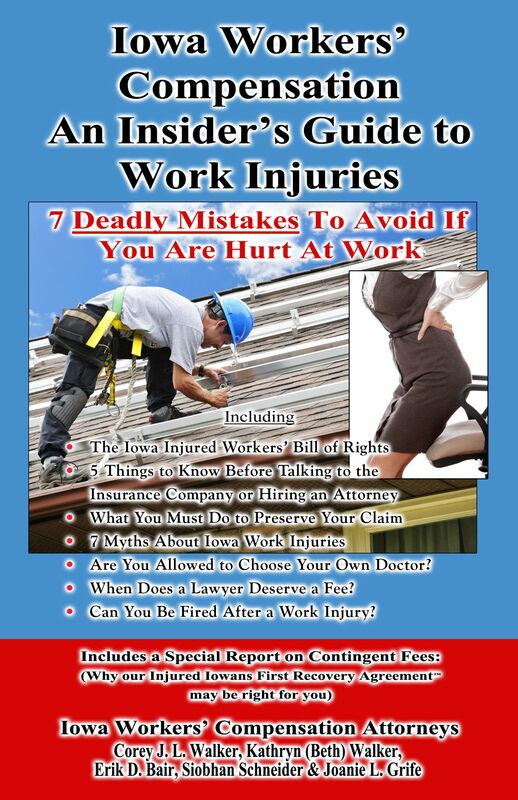 This will be important information to pass along to your Workers’ Compensation attorney, who you should also contact as soon as possible - (888) 435-9886. In most cases, you will need to contact your employer within 90 days of the on-the-job injury, though your employer will likely know right away if there has been an accident at work. However, it is best to formally speak with someone in the company’s human resources department to ensure that you have all of the information you need and that your employer has given you sufficient information. Unfortunately, this is not always the case, so you will need to be as proactive as possible.